It is a non-political, non-sectarian, non-profit Soldiers and Veterans fraternity. On July 17, 1944, a group of FIRST TEAM Soldiers in the Admiralty Islands agreed to form an Association of 1st Cavalry Division Soldiers and Veterans to preserve old friendships and conduct periodic reunions. It is country-wide. National headquarters is located in Copperas Cove, Texas. There are several chapters throughout the country, as well as a chapter in the active Division at Fort Hood. Anyone who has been assigned or attached to the 1st Cavalry Division anytime, anywhere, is eligible for Life membership. There are more than 28,000 men and women on our active membership rolls. 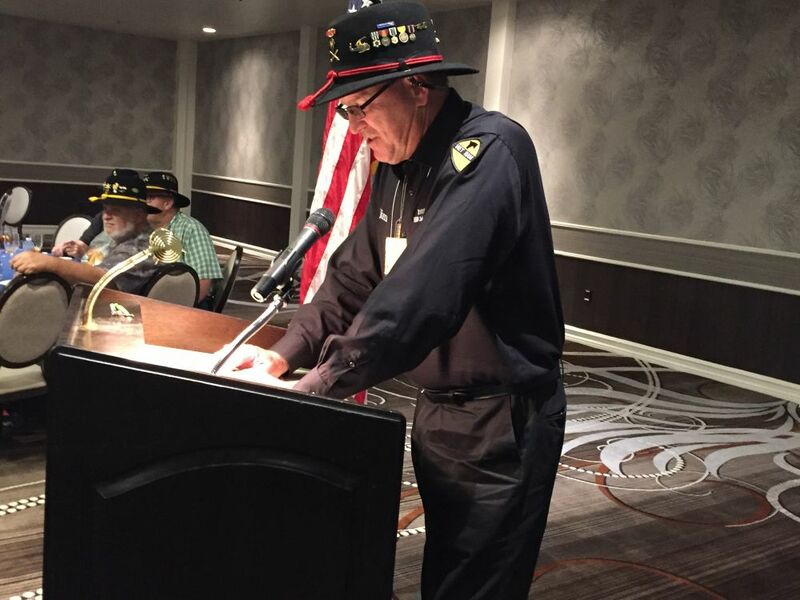 Friends of the Cav who have not served with the Division can become Associate members for $15 annual membership and $150 for a life membership. To preserve and strengthen friendships through annual reunions, chapter activities, and our bi-monthly newspaper, the SABER; to meet new people and make new friendships through Association activities; to obtain tangible evidence of membership in this great fraternity, i.e., lapel pin, membership card and certificate, decals, and a one year subscription to the SABER. The 1st Cavalry Division Association USAA Rewards™ World MasterCard® is now available to members of the 1st Cavalry Division Association. You are also eligible to help special projects such as the Scholarship Foundation and Museum Foundation. We share a great Division heritage — horse cavalry, ground and airmobile infantry, armor and our current modular configuration — Once Cav, Always Cav! The Foundation of the 1st Cavalry Division Association offers scholarships of up to $1,200 per year for up to four years to children of 1st Cavalry Division Troopers who have died or become totally disabled while serving in the Division in any war. This program was begun in 1968 to assist the children of battle casualties of the Vietnam War and expanded to children of peacetime active duty Association members who died while serving in the Division. The Foundation has provided more than $765,000 in grants to 481 applicants through this worthy program that continues today. Since 1988 more than $255,000 in scholarship grants have also been provided to 275 active duty Division Soldiers, their spouses and children. Additionally 232 descendants of the Ia Drang battle participants received grants in the excess of $490,000 since the inception of that program in 1997. Total scholarship money paid out in all programs is over $1,510,000. The 1st Cavalry Division Association Museum Foundation is a charitable and educational activity established for the express intent of providing support to the 1st Cavalry Division Museum located at Fort Hood, Texas. The primary goals and objectives of the Museum Foundation are to: (1) Build a new Museum facility. (2) Support historical projects, programs and research that preserve the history of the 1st Cavalry Division and its Troopers. (3) Support Museum programs that educate the public and increase its appreciation for the contributions of the division. (4) Promote, counsel and provide support to organizations, both government and private, that are committed to similar goals and objectives. We are a group of Soldiers and former Soldiers from privates to 4-star generals who share a bond of service with the FIRST TEAM. We are dedicated to supporting the Division and each other.